Sweet Cheeks Adventures is helping with promotion of this Holiday Giveaway! Good Luck!! Do you love flowers? Do you love Snoopy? Do you love cookies? If you answered yes to all 3 then you're going to love this amazing giveaway we have planned for you today. 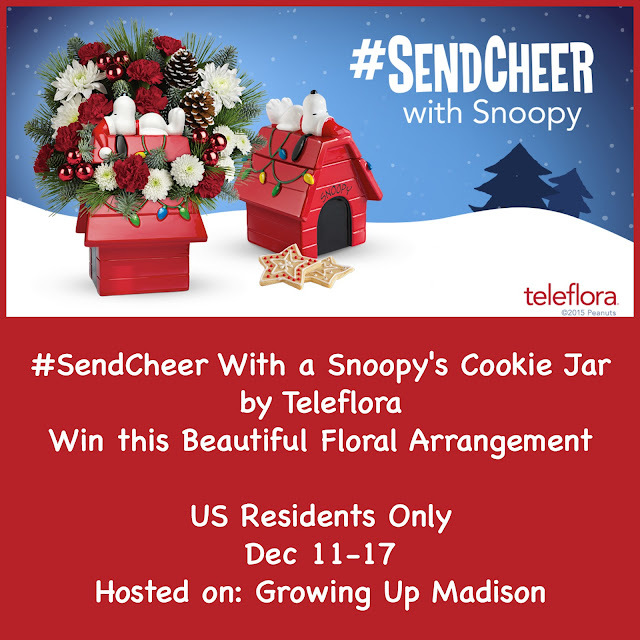 In collaboration with Teleflora and Growing Up Madison, we bring to you the Snoopy Cookie Jar Floral Arrangement Giveaway. This charming arrangement includes red miniature carnations, white button spray chrysanthemums, white cushion spray chrysanthemums, noble fir, white pine, and seasonal decorations. Delivered in Snoopy's Cookie Jar by Teleflora. This prize is fulfilled by Teleflora and winner will be randomly selected by PromoSimple. I would gift this to nephew and his mom. The flowers for her, and the cookie jar for him. My friend could use some holiday cheer so I'll give this to her.